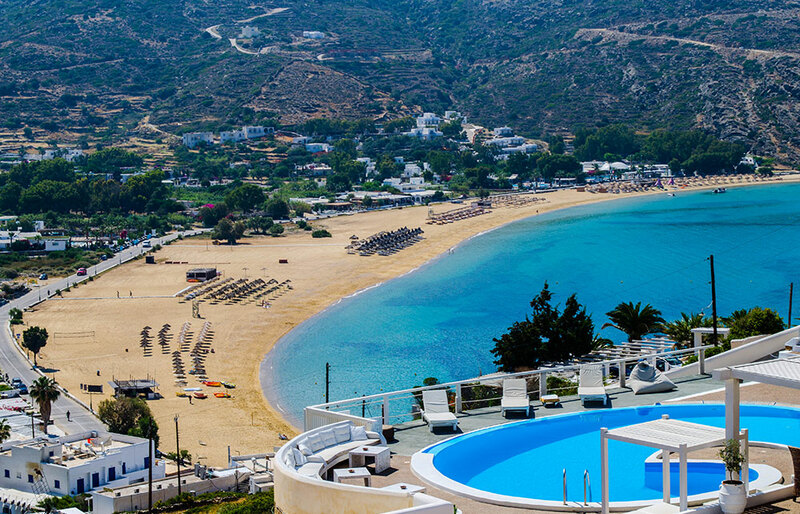 Ios is probably one of the top destinations in the Aegean when it comes to natural beauty and among the most preferred ones in terms of the entertainment. 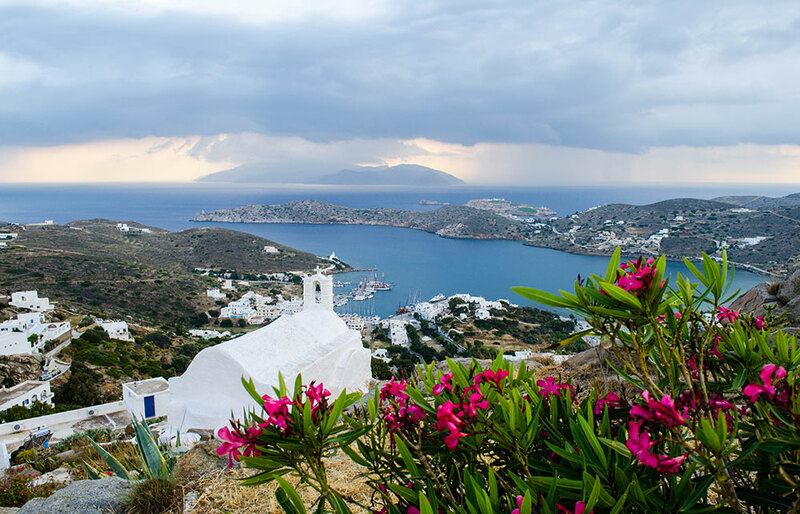 This Cycladic “flower” as its name in ancient Greek denotes, has managed to tie everything up and offer a true Cycladic experience to its visitors. Apart from stunning beaches and world famous nightlife, Ios has also great places to relax, sights of archeological interest and cultural attractions, all combined with the picturesque Cycladic character. But above all it has a great relaxing vibe. In Ios you will have real fun, party until the early morning hours, explore caves or wreck dive, relax at secluded beaches, swim in the crystal clear emerald waters, try various water sports, eat superb local delicacies or even visit one of its 365 churches (one for each day of the year!). Ios has nothing to be jealous from its strongest rival Mykonos, since its offers great value for money and promises an unforgettable travel experience. 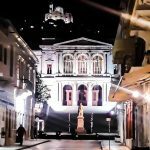 Church of Panagia Gremiotissa: is one of the most famous churches in Ios dedicated to Virgin Mary, the saint protector of the island. Its name means Virgin Mary of Collapse. Legend has it that the church was built three times and every time it collapsed, until it was built on top of Chora. It is very easy to visit it, due to the distinct palm tree in its front yard that can be seen from almost every part of Chora. Homers Tomb: according to tradition, Homer, the famous ancient Greek author and poet, was buried in Plakoto, in the northern part of Ios. The area is easily accessible by car. His grave is on top of a hill, a few hundredth meters from the road. The scenery around the grave is breathtaking and definitely worth the visit. 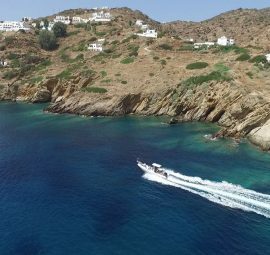 Ios secluded coastline: a cruise is the best way to visit some of the most beautiful beaches of the island which are only accessible by boat. 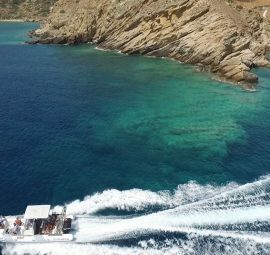 Snorkeling, cave exploring, wreck watching are also few of the top things to do in Ios, in order to enjoy a variety of what the island has to offer. Museums: host important collections and exhibits in the island of Ios. While visiting, don’t forget to stop by the museums for a chance to see the island’s long history and remarkable art work. Archaeological Museum: holds archaeological findings excavated on Ios, prehistoric tools, Cycladic objects and statues. Museum of Giannis Gaitis and Gabriella Simosi: assembles the works of art of the great artist and friend of Ios, Giannis Gaitis and his wife’s Gabriella Simosi. Museum of Modern Art: art works of Jean Marie Drot, French writer and documentary maker, and cultural exhibitions of other artists. 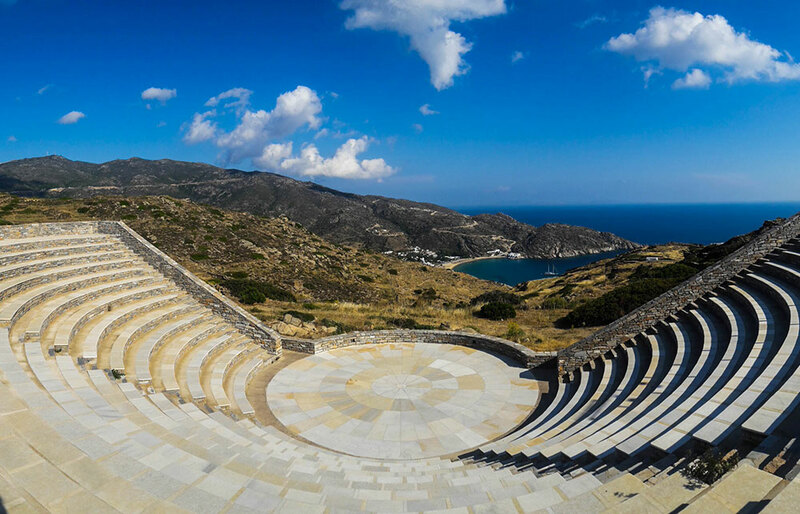 Odysseas Elytis Open Theater: is an amphitheater located on the top of the hill in Tsoukalaria, behind the windmills that stand there. The theater has been named after the famous Greek poet and Nobelist, Odysseas Elytis. It was constructed in 1997 in ancient Greek style and can host up to 1100 people. Every year many cultural events and performances take place here, including the “Omiria” festival in the memory of the ancient poet Homer. The stunning view from the theater is definitely worth a visit even when there is not a performance taking place. From up there you will not only enjoy a panoramic sea view but also an amazing sunset. Skarkos: is one of the most important prehistoric settlements in Aegean and an award-winning archeological site, located on a hill close to the port and Chora. Excavations have brought to light an exceptionally well preserved settlement from the mid 3rd millennium BC and a cemetery from the mid 2nd millennium BC. The settlement is estimated to have been home to 200-300 people. There is evidence of impressive architectural characteristics, such us paved floors, drainage system and two stories buildings, and complex social structure, such as the use of stone and bone stamps. There are also many examples of kitchen utensils, pottery and work tools, the majority of which are hosted in the n the Archaeological Museum of Ios in Chora. Venetian Castle (Paleokastro): is situated on the eastern side of Ios, 15min walk from Psathi. Paleokastro (which means “old castle” in English was built in 1397 AC by the Venetians to protect the island from pirate attacks. Today remains of the castle along with parts of its walls stand on the very top of the cliff. 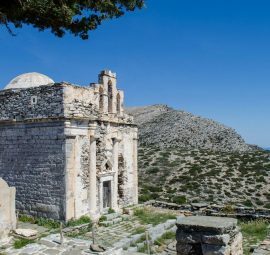 Inside the walls of the castle you will also find the small church of Panagia Paleokastritissa (meaning “of the old castle”) dedicated to Virgin Mary. Windmills: are the trademarks of the island, found on the top the hill in Chora. Back in the old days, the mills were used to produce energy from the winds. Today they stand as monuments of the island and symbols of the unique Cycladic architecture. Right before the windmills on the slope of the mountain, it is a beautiful place to watch the sunset in Ios. Chora is the main settlement in Ios, 15 min walk from the port. It is built amphitheatrically on the slopes of a hill on the western side of the island. On the very top of the cliff is the church of Holy Mary Gremiotissa, offering unique sunset views. 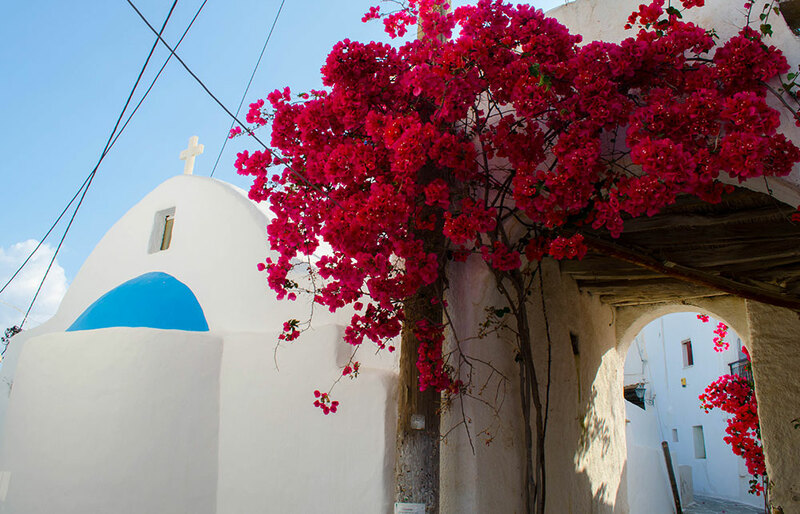 Chora is a very picturesque Cycladic village, full of stairs that easily charms every visitor with its white houses, small chapels and paved narrow alleys. 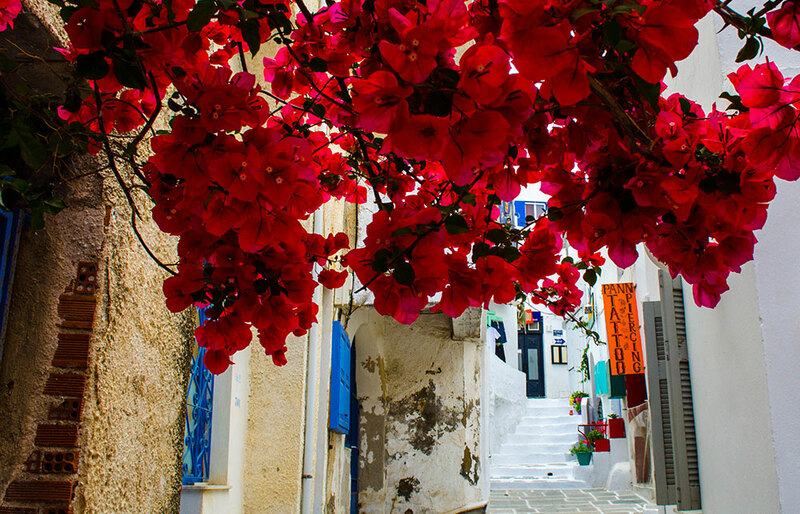 In fact, Ios Chora is one of the listed traditional villages of Greece. The main road of the village is touristically developed and filled with boutiques, atmospheric restaurants, cafes, bars, and clubs for every taste. This peaceful, Cycladic alley, turns into a big clubbing stage as soon as the sun goes down. 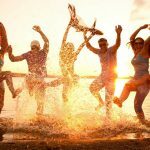 During the summer months, Chora gathers youth from all over the world that party until dawn. 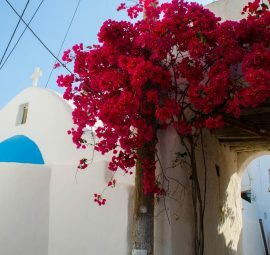 Yialos is the port of Ios and the second most populated village after Chora. Yialos has its own life and market activity. The area has rooms for rent, hotels, bars, restaurants and shops. 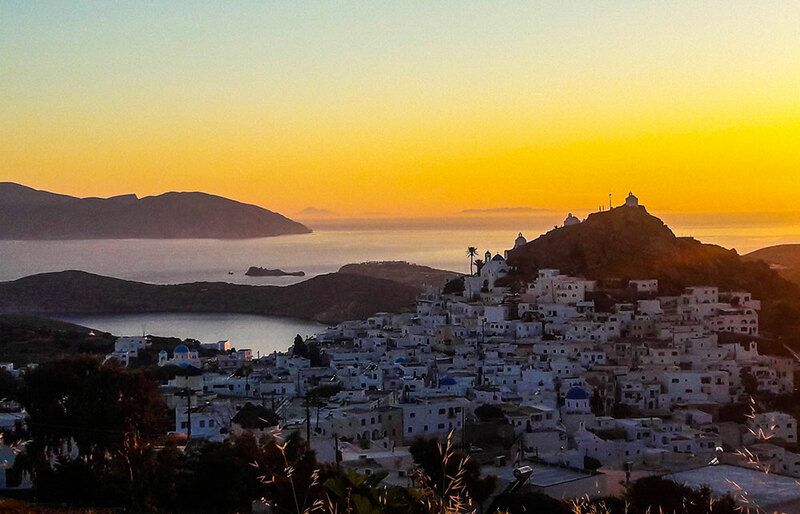 This picturesque settlement is built amphitheatrically overlooking the sea and keeps the traditional Cycladic character of the island. Agia Theodoti: is a long sandy beach with crystal clear waters on the north east side of the island. Agia Theodoti’s calm atmosphere is ideal for those looking for relaxation and tranquility. In the area you will find traditional taverns. Access is easy by car. Koumpara: is a beautiful long sandy beach with blue waters, located on the west side of the island and is considered one the best sunset spots on the island. The beach is well organized with sun beds, umbrellas and water facilities. 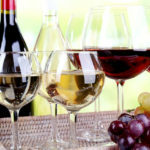 In the area you will also find traditional taverns with local dishes and accommodation. You can access it by car or by bus. 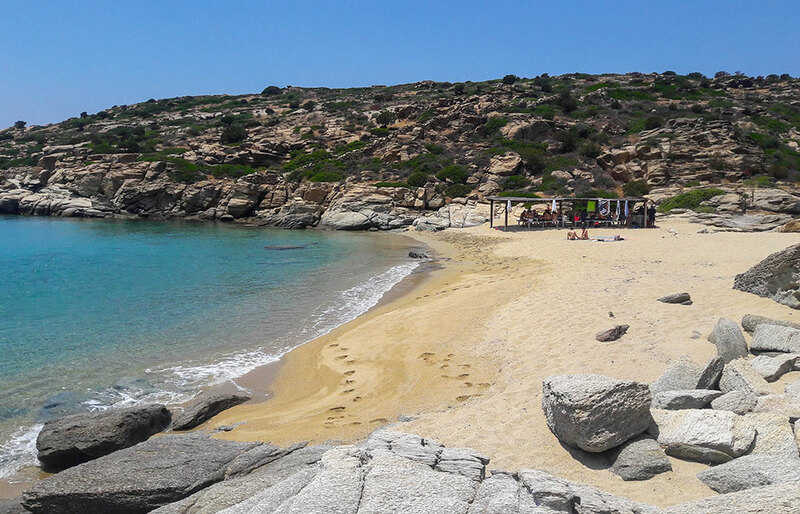 Magganari: is formed out of 3 small coves with white sand and turquoise waters and is considered to be one of the most beautiful beaches in the Aegean. The Big Deep film chose the exotic landscape of Magganari to shoot some of its scenes. The beach is ideal for relaxation and serenity. 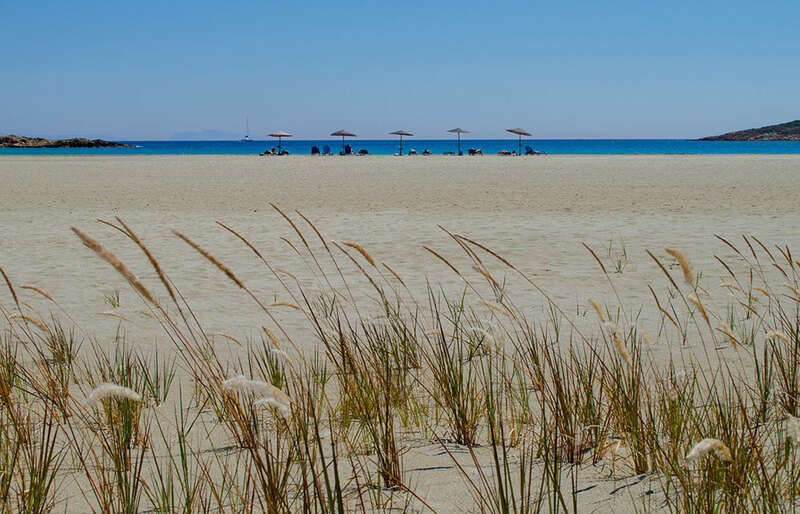 There are sun beds and umbrellas at two of the coves, while you will also find water sport facilities and some tavernas, where you can taste local dishes. The beach is located on the south part of the island, 23 km from Chora and is accessible by car. Mylopotas: this stunning golden beach is located on the west side of the island and is very popular for its party scene, sunsets and great food. 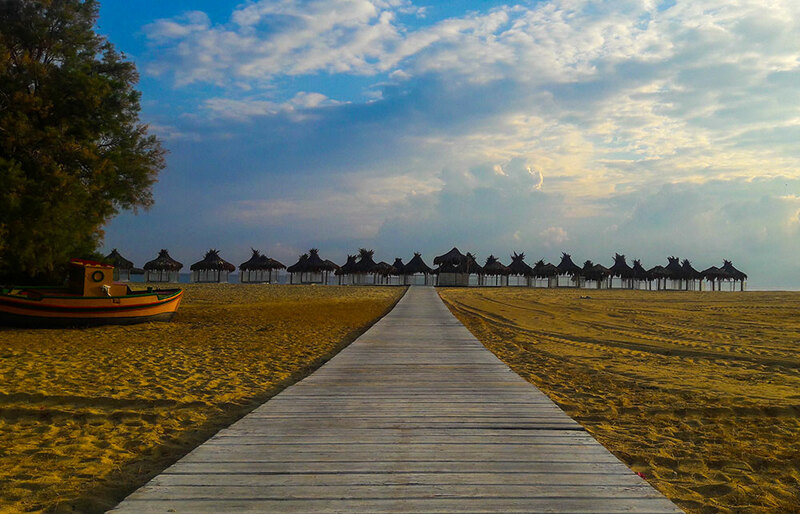 Its fine sand stretches for kilometer and is covered with sun beds, umbrellas, many water sports centers and a beach volleyball court. The area is also filled with all kind of touristic amenities, beach bars, swimming pools, hotels, cafes, restaurants and mini markets. This is where the party usually begins in Ios. Mylopotas can be reached by car and bus. 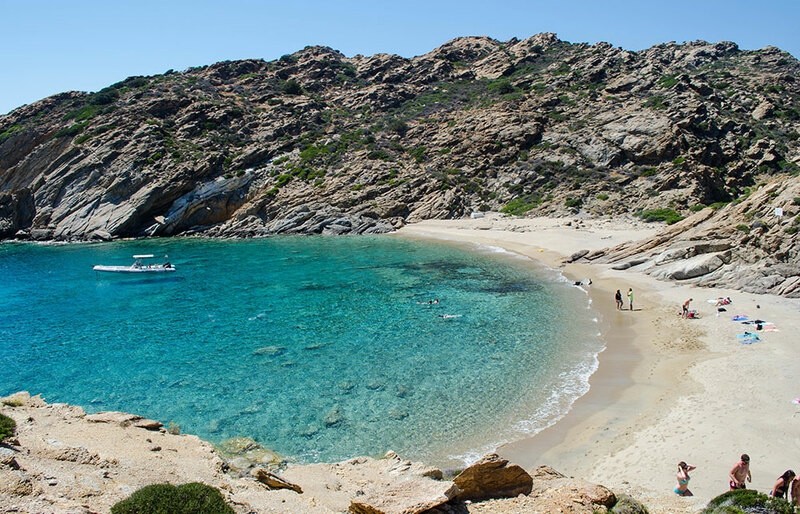 Tripiti and Pikri Nero: are small secluded beaches on the southern side of the island with soft white sand and transparent blue-green waters. The beaches are isolated and unspoiled and can be accessed only by boat. Yialos: is a small beach situated just a few meters from the port of Ios. It is a beautiful sandy beach with crystal waters, covered by trees that provide natural shade. 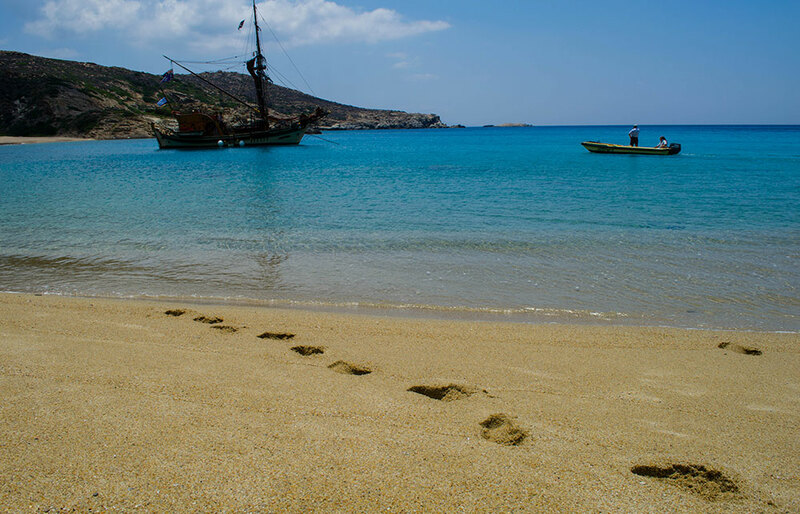 The beach is a 20 min walk from Chora and is usually pretty popular. It is well organized with many tourist facilities, including sun beds, umbrellas, hotels, tavernas and bars. According to tradition, Ios took its name from the ancient Greek word “Ion”, referring to the violets that fill its countryside every spring. Others believe that the name Ios comes from the same Phoenician word “Iion” which means “pile of stones”. Today, locals call it Nio, a name that dates back to the Byzantine Era. Legend has it that the island was the birth place of Homer’s mother, Klymeni, and the final resting place of the great poet. According to Herodotus, Homer was buried in the area of Plakoto. Many historians also confirm Ios as the last resting place of Homer, turning the myth into a tradition. Prehistoric Times: Various findings show that Ios was inhabited from the Prehistoric Times. Evidence of the first prehistoric settlement can be seen on the hill of Skarkos. Additionally, other smaller prehistoric settlements are found all over the island and reveal a lot of important information about that period and its flourishing community. In the 2nd millennium BC Ios was under the influence of the Minoan and consecutively the Mycenaean civilization and culture. The island was then inhabited by the Achaeans, Phoenicians, Durians and Ionians. Ancient Times: Ios joined the Athenian League and became an established democracy. 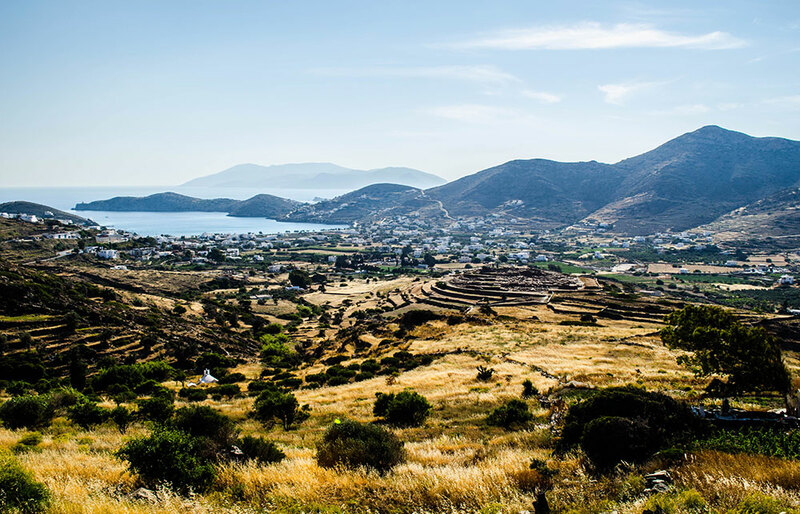 Later it came under the Roman rule and was used as a place of exile like many other Cycladic islands. The Venetian Rule and the Ottoman Empire: Along with the rest of Cyclades, Ios suffered from pirate attacks. In the early 13th century Ios came under Venetian rule. Governor Marcus Crispus fortified the island; remnants of the impressive castle he built are visible today on the north end of the island. The island fell to the Turks in 1537 and was not liberated until the 19th century. Greek State and Recent Times: The island and became a part of the Modern Greek State in 1829. 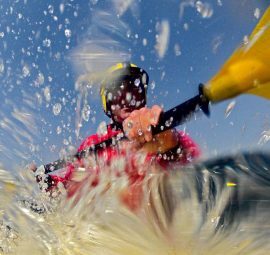 In recent years Ios is considered one of the top party destinations in the Mediterranean. Every year young travelers from all over the world choose Ios as the ultimate party destination. 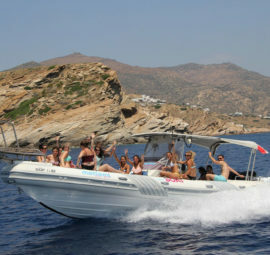 It is not coincidental that the Chora of Ios has the biggest number of bars and clubs in the Aegean, along with Mykonos. Omiria Festival: is probably the most important cultural event held on the island. The festival takes place every May in honor of the great poet Homer and is held under the auspices of UNESCO. Activities include art performances, exhibitions, contests and concerts. Theater of Odysseus Elytis: hosts many cultural events during the summer months.